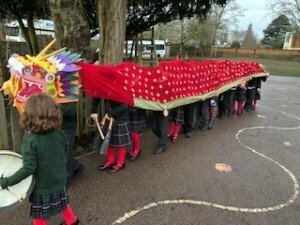 Everyone in school has enjoyed celebrating Chinese New Year this week. 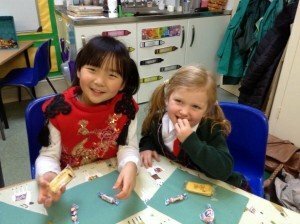 On Monday, Mrs Haiqi Li, our Mandarin teacher, delighted all the children with her array of traditional Chinese decorations in preparation for New Year the next day. On Tuesday, Reception welcomed Mrs Li, Yuru’s Mummy, to lead their celebrations. In the kitchen, a huge amount of work was put in to create a veritable Chinese feast for all to enjoy. 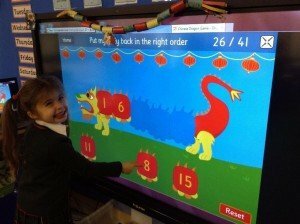 It has been a fun filled week in Reception; everyone has thoroughly enjoyed celebrating Chinese New Year. 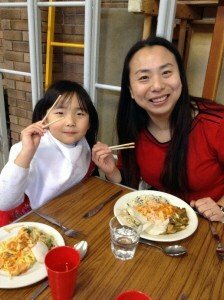 It was a real treat when Yuru’s Mummy joined the class on Tuesday and helped to celebrate this special day. 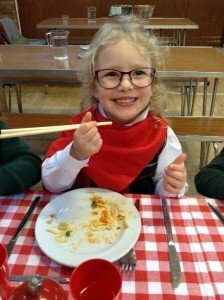 Using chopsticks to eat lunch was a real highlight too! 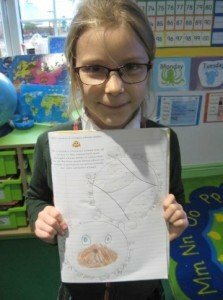 The children were fascinated by the story of ‘The Great Race’ and they were excited to discover which animal the year of their birthday relates to. 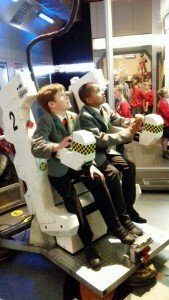 They were very keen to take part in their own races in P.E. and were super at moving like the different animals in the story. 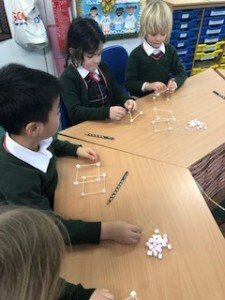 In Maths, the children enjoyed finding themselves a ‘Ten partner’ for the special ‘Ten dance!’ It was a great way to explore number bonds to ten. 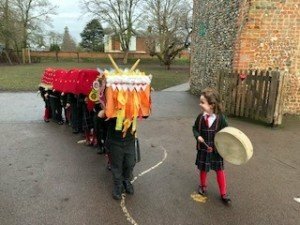 Year 1 also celebrated Chinese New Year with gusto. They ate fortune cookies for snack and enjoyed reading out their fortunes. 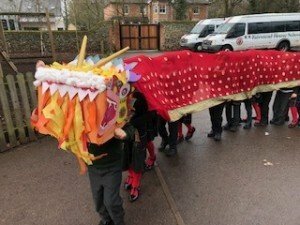 They then dressed up in their Chinese dragon costume to enter the dining hall playing drums and bells for all to see and hear! They then ate a beautiful Chinese lunch with chopsticks. 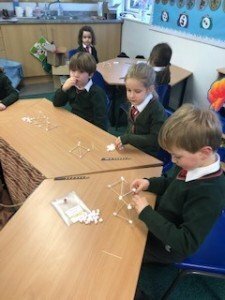 The children have also been looking at 3D shapes and their properties and had fun taking part in a treasure hunt for shapes outside and had a go at making their own with marshmallows and cocktail sticks – rather fragile, but great fun! 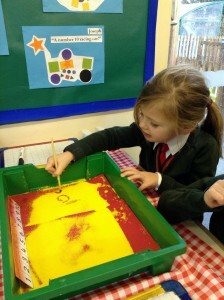 In English, Year 2 have been writing Calligram poems. Calligram poems represent the topic of the poem in their shape. 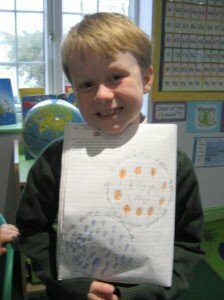 The children had great fun writing poems around a simple circular shape. They used their amazing imaginations to turn the circle into something exciting, such as a dog basket, a clock and a chocolate cake! 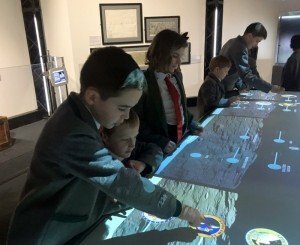 In Science, within their curriculum topic, Vesuvius, Year 3 have been exploring in and around school to locate natural and man-made rock. They have been learning how to name the three different types of rocks, by explaining the difference between natural and man-made rocks and using the appearance of rocks to group and compare them. 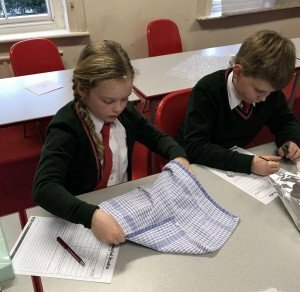 They were disappointed to not find any naturally occurring obsidian pumice or basalt from Vesuvius in the school grounds but have classified examples of each along with many other rocks in the classroom. 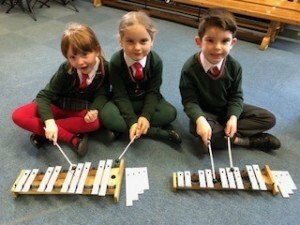 This week in Science, Year 4 received a challenge from a music band that have received complaints for making too much noise! 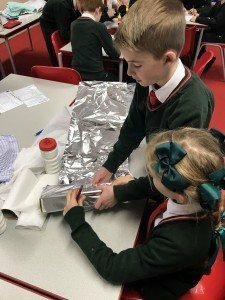 They investigated which materials would be best for soundproofing the band’s studio. 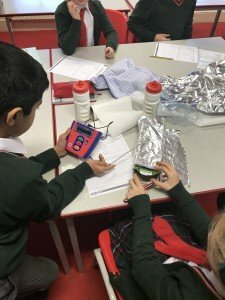 To ensure their tests were fair, they used the same sound source; two layers of each material and the same data logger to measure the decibels. Finally, they wrote letters to the band explaining their conclusions. 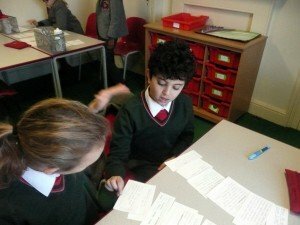 Year 5 has been working very hard in class this week. 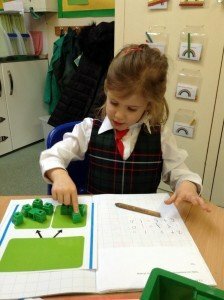 In Maths, we have been honing our mental arithmetic skills exploring different strategies for multiplication and division. As part of English and Humanities, we have been finding out about our chosen Eastern European country. The children have been busy researching both physical and human geography features and comparing them with their own country. 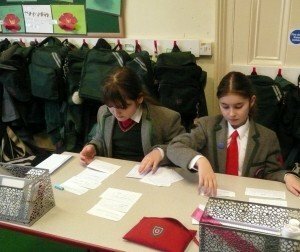 The topic will culminate next week with the children writing a Non-Chronological report. 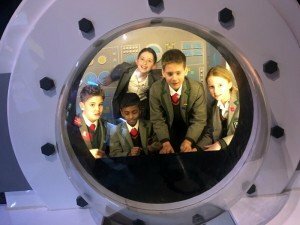 On Monday, Years 5 and 6 travelled to the Space Centre in Leicester. 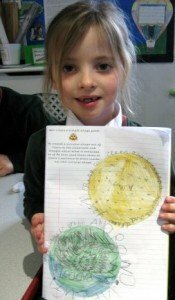 The children were given a fantastic talk about the different constellations and galaxies. 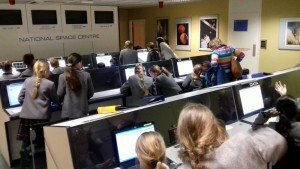 The children broke into small groups and explored various areas of the Space Centre. 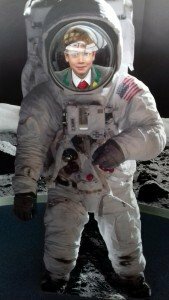 They learnt about the solar system, gravity, spacesuits and life in space. 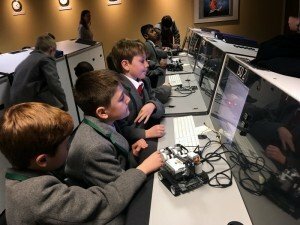 The children then attended a workshop, where they had to programme moon rovers to navigate various objects. 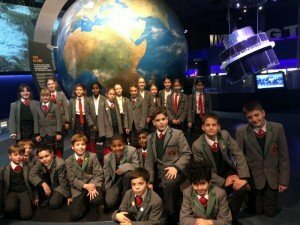 It was a very informative day which the children thoroughly enjoyed. 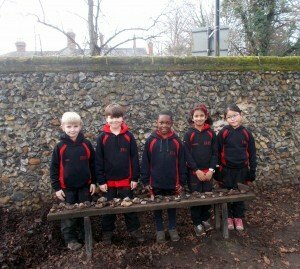 All the boys in Years 5 and 6 travelled to Framlingham to play hockey. The boys played exceptionally well, moving the ball around the pitch with skill and speed. In the first half we scored a goal. The children played hard in the second half and defended well but did not manage a second goal. The final score was 1-0 to Fairstead. Well done, boys! Keep up the good work. 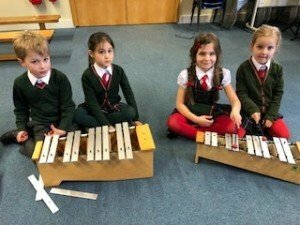 In Music, Year 1 have improvised on tuned percussion, using notes from the G Pentatonic Scale to create simple melodies to enhance our story about the Yellow River, the great Wall of China, the Gobi Desert and the Mongolian Mountains. 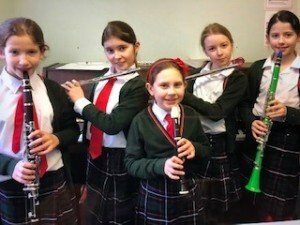 Tuesday – Windband: We have a fine group of Woodwind players, including flute, clarinet and descant recorder. They are focusing on music by the classical composer, Mozart. Rehearsals are in full swing for our musical production ‘Olivia!’ Everyone needs to memorise the lyrics to the songs and their lines in the script. Our next Informal Tea Time Concert is on Tuesday 12th February in the Performing Arts Centre. For parents of children in Key Stage 2 who have worked hard to gain the pen licence, please ensure that the fountain pen you supply is a suitable one, such as the V Pilot or a Nexus pen. Please speak to your class teacher if you are unsure. Just a gentle reminder that we would appreciate your sensitivity when giving out party invitations if not every child in the class is invited; in which case, please deliver the invitations out of school. This week, Kindness Cups were won by Virginia in Year 1 and Junior in Year 6. This week, we wish a happy birthday to Thea and Isaac in the Nursery, William in Year 1, Alexander in Year 2 and Julian in Year 3.